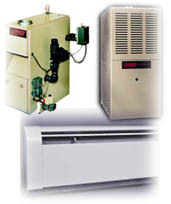 The heating system of a home provides warmth and comfort for areas with seasonal change. Dwellings in many areas of the country require the operation of a heating system for more than half of the year. Modern heating systems use either electricity, gas or oil for fuel. Typically a central heating plant, either a boiler, furnace, or a heat pump, provides heat which is distributed evenly on demand throughout the home using a distribution system of ductwork for warm air and piping for hydronic. The distribution systems of each dwelling are usually as important as the heating plant itself. Regular servicing by a professional company is recommended on all heating systems for both safety and efficiency. Your professional inspector will run the heating system to determine its safe operating condition.